Today’s health and wellness space has focused primarily on quantifying people’s movement, from their steps to their heartbeats. Data tracking has been the proven success for Nike Fuelband, Apple watch, Fitbit products, and Jawbone among many wearable trackers. I want to explore opportunities within the health and wellness spectrum of technology. In particular, I’d like to look into how to measure body positivity as a viable “metric” to promote and endorse health and wellness. There are quantitative measurements that serve as a metric for health and wellness rather than through qualitative measurements. I define qualitative measurements emotional wellbeing and positive habit forming behaviors. One of my goals from this project is to define and evaluate these measurements in the form of a design prototype. Timeline: Over a 4 month period, I’ve conducted several co-design sessions, participant and subject matter interviews, artifact analysis through exemplar collection and synthesized data into a cohesive and explanatory document detailing my findings into a high-fidelity prototype. The timeline and Action Research Plan Chart below detail the actions and purposes as well as the timeframe for this project. Through an exploratory exercise called “design space schema”–I began to ideate on a problem space to work with–many topics arose such as perceptions of body image, body shaming, off scale victories, motivations, lifestyle changes, and emotional perceptions. Opportunities in this problem space. How might we explore positive connections between fitness and body image throughout a lifestyle change? By leveraging this statement through my research, I’ll begin to identify opportunities that I can iterate and design a meaningful solution. I conducted several stakeholder interviews with members and fitness instructors of Next Generation Personal Training (NGPT). In particular, I documented the journey of two individuals who made significant transformations to their overall health and lifestyle. Below are some key insights from the interviews. Has lost 90 pounds in one year. She joined on a whim- saw before and after pics. Joined impulsively to a bootcamp program at NGPT. Has been going for over a year. One of the motivations was her young daughter. She’s a single mother and playing with her daughter was difficult. This was the turning point for her to make and commit to a lifestyle change. Has lost over 60 pounds in 3 years. Initial goal was exercising, being active. 63 years old and can do things that she wasn’t able to do such as getting up from a chair by pushing off with her arms. Survived a stroke and still continued to work out and become healthier. Had previously failed at 3 prior bootcamps before successfully completing one at NGPT. “We promote a unique community, a special environment, you have to come here and plug in. You have to let us guide you, let us believe in you, then you can build that belief in yourself and that’s when magical stuff starts to happen”. This was my take on a design method called “graffiti wall” where people are asked to write down something on a large sheet of paper. This is usually done in a private space where it is anonymous. For this exercise, I wanted members of the gym to be proud rather than hide their victories. I had members write on a whiteboard at the gym their victories and share it with others. Insights: Many of the victories revolved around goals in strength, perseverance and positive feelings of confidence. Critical Design Proposals: This form of divergent thinking forces the designer to explore solutions through collage and defamiliarization. By assembling particular words, images, and sketches together, designers play around with potential design solutions as an exercise of even a direction based on key insights and observations they’ve detected from their research. It allows for designers to navigate around particular contexts and see opportunities that they do not have to necessarily commit. Collecting exemplars can be a source of inspiration for many designers. This helps designers sort out ideas and inspirations, develop questions and ideas by viewing the landscape of the various contexts surrounding a particular problem space. 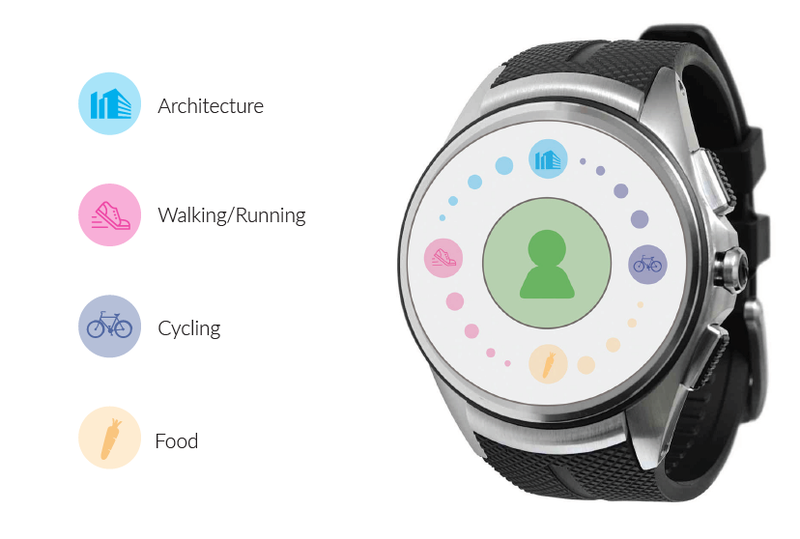 By looking at several examples of various topics and design outcomes, I was able to collect and analyze current trends in the health and wellness space from wearables, to forums, to clothing. I also collected examples that surrounded various qualities and emotions like empowerment through design, and themes of shame throughout cinema. When collecting empowerment through design exemplars, they were particularly striking in the sense that oftentimes empowerment in design often came from challenging a taboo or stigma. This form of evocative sketching allows the user to explore hypothetical solutions that are farcical and impossible in nature. These evocative sketches are illustrations that can allude to a reality that is not yet possible. These sketches are generally created from the designers own reflection into a particular context or observation that designers and stakeholders can recognize. These cards offer a new way to look into the future that we may not have explored. Key insights through evocative sketching: This provided opportunities into saving and expending energy. It helped me think about playfulness in my future design spaces. These codesign sessions were brainstorming exercises that empowers participants to explore design opportunities with the designers. I conducted three co-design sessions with experts in various opportunity spaces. I created a simple low fidelity sketch of what the design could look like and had my participants apply their expertise and contexts into the design sketch. 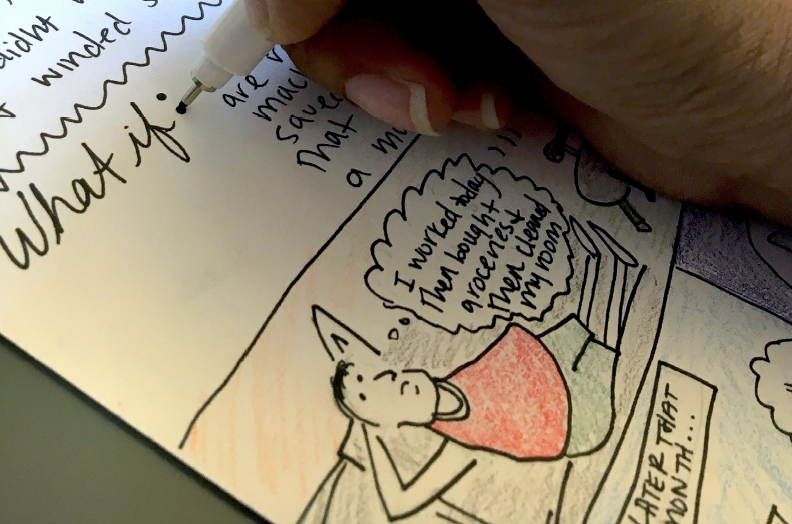 This helped them buy into the process, but also not freak out about the fidelity of sketching. For the codesign session I wanted people to focus on the idea that this sketch could signify rather than functionality. This fulfills two purposes. The first purpose is for users to not feel intimidated by the sketch in order to imprint their ideas onto the prototype. The second purpose is so that they can provide insight into whether they see this design being a standalone device or if it exists in a wearable device that already exists. This prototype was designed to represent a compass. The image in the middle is a dial with colored circles surrounding the dial, much like a watch. This design represents metaphors through watches and compasses that can evoke messages of identity and finding oneself. Explore further and beyond the domain of fitness and health through co-design with Subject Matter Experts (SMEs). Use a basic scenario best appropriate for each SME and have them use their knowledge to apply it into the sketch that I created and/or allow them to create an entirely new sketch. Should my design exist solely as an application on a wearable device or as a standalone tangible device? Based on my research and analysis, I realized that my design did not exist outside of quantitative measurement, but rather, it could compliment it. 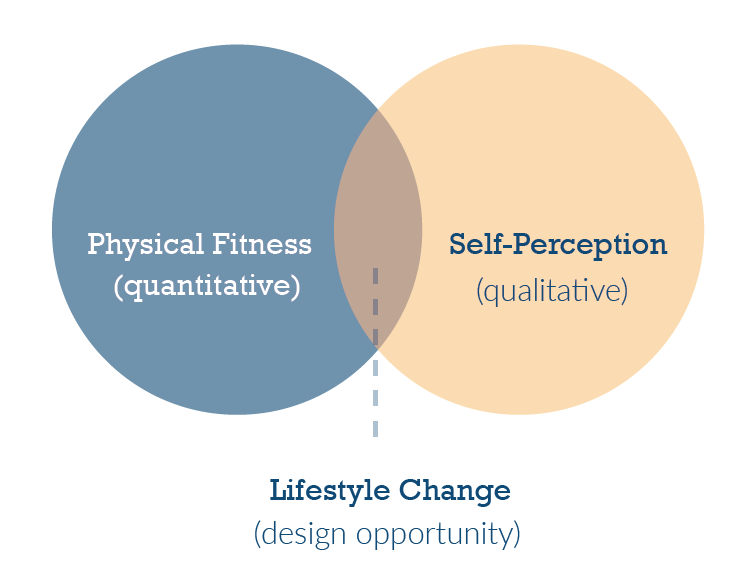 From multiple interviews with people that have gone through extensive lifestyle changes, it was clear that quantitative evidence is not early enough, that self perception needed to be a component in this design space. From my analysis, opportunity areas like motivation, empowerment, and community were venues for design opportunities. I codesigned with 3 participants in various domains from fitness, performance, and travel to formulate opportunities through felt qualities to develop behavior change. The evaluation is broken down into 3 parts. The first part of the evaluation was to explore 3 different domains and apply it to a design that I developed. The idea was to show the following design that I created and present a scenario for each session and have the SMEs come up with a solution. The rationale for this approach allows me to explore beyond just quantitative tracking and find unique intersections of various domains within my design. Scenario Presented: Incorporate your framework from NGPT into this device. How can someone utilize this design to begin a lifestyle change? What do the colors signify? What do they mean in context to the person using it? Scenario Presented: If this design represented you, what can it do? What would be the primary purpose? What do the colors signify? What do they mean in context to the person using it? Scenario Presented: Incorporate the notion of travel for fitness into this device. How can someone utilize this design to begin a lifestyle change? What do the colors signify? What do they mean in context to the person using it? The co-design sessions presented two very different design directions. One opportunity takes a critical approach to challenging negative body image and misogynist comments by empowering users to search relevant materials for lifestyle changes. The other direction allows users to seek support and community through their lifestyle change. While these are two very different applications, there is an opportunity to combine these directions into a single powerful design. 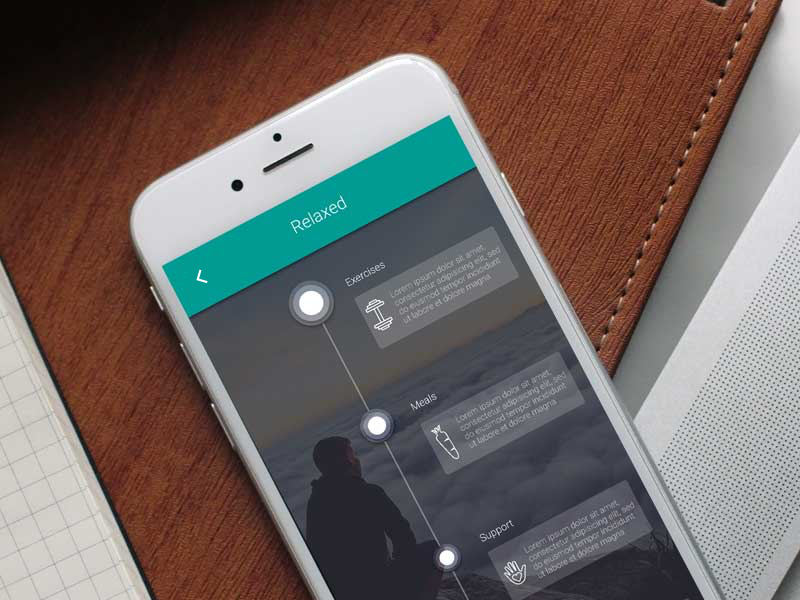 This mood-based application allows users to input mood and receive recommendations for lifestyle recommendations for health and wellness. This provides users the opportunity to traverse difficult days or time periods in their lives through smaller activities. By completing smaller activities in more difficult days, this user can feel accomplished regardless of the painpoints they are experiencing and look forward to their overall goals instead of taking a step backwards. According to gym owner Adam Schaeuble, clients that achieve rapid success in their weight loss goals will often break their regimen often through a hardship. Rather than holding themselves accountable, they often stop what they do altogether. Accountability anchor points are key for success. By setting small goals daily, the goal setting can help motivate participants whether big or small. Codesigning with Amanda allowed for this great design between adventure, travel, and health and wellness. Oftentimes, traveling is seen as a trap for making healthy decisions. This concept allows users to choose from a variety of categories in order to become motivated with working out while on vacation or within one’s own community. This design empowers the user to embrace an adventure within the confines of the categories and go on adventures whether big or small. This application can build community by engaging users to explore their own town through food, architecture, and an active lifestyle. This concept has a gamification component that encourages users to challenge themselves or their friends to explore within their community or through travel. It’s no secret that a lifestyle change is a journey rather than a destination. Oftentimes, people seeking lifestyle changes have an ultimate goal they would like to reach and when they do not, they ultimately stop short. The co-design session with Adam informed that setting multiple goals is key to success. Setting smaller goals and larger goals can provide the motivation to keep moving forward. The codesign also informed the need for users to acknowledge not only their future goals, but goals that they’ve already accomplished. This application includes a goals feature that provides them the opportunity to view current goals, future goals, and previous goals. In conjunction with goal setting, community support is key to success in any lifestyle transformation. Community support is a two sided approach. Not only does the user receive support when they reach a roadblock in their journey, but they can also provide support to others within their community. This application would work within the realm of gym communities and be a component of a particular gym’s established ecosystem. This can also be utilized by people that may not have a particular gym that they are a part of as well. The primary focus is to create and strengthen relationships with something one is already a part of.